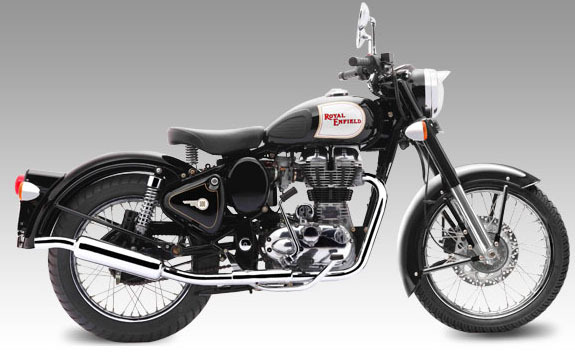 Royal Enfield USA's top-of-the-line Bullet Classic 500 now comes as a bigger motorcycle, the C5 Special. You may need a magnifying glass to see the difference in photographs, but you'll feel the difference in your bottom. The difference to your bottom line is likely to be only about $100. For that you get a larger, 19-inch front wheel (as opposed to two 18-inch wheels on the C5 Classic), a somewhat different riding position and a straight front fork as opposed to the offset fork on the C5 Classic. The fork is the same length as before, but with different geometry. The C5 Special will be available in all 50 states. 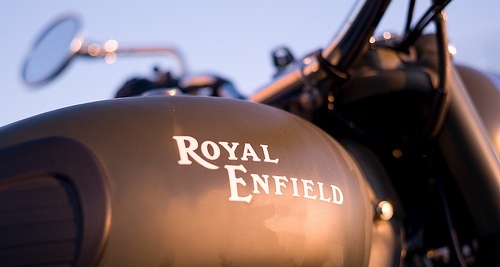 According to a notice that went out to U.S. Royal Enfield dealers last week, the C5 Special will appeal to larger riders who find the C5 Classic smallish but prefer its styling to the B5 and G5, which use the 19-inch front wheel. The new fork and larger front wheel will give a more cruiser like feel on the highway. The C5 Classic will remain the choice for those who want maximum handling. The new C5 Special will be available in all C5 colors except the Red Chrome. nice website !! full of informations !! The royal look....The true ruler of the roads....just luv it!!!! is it available in Thailand?? The sole reason that I ditched the 500 cc beast and chose the electra was that it was small for my built. Thanks RE! Time for RE to halt cosmetic changes and offer more substantial ones. A change in suspension is urgently desired, better quality rear shock absorbers will be useful. Also some necessary changes in power output from the boring UCE 500 mill would help lure more customers.